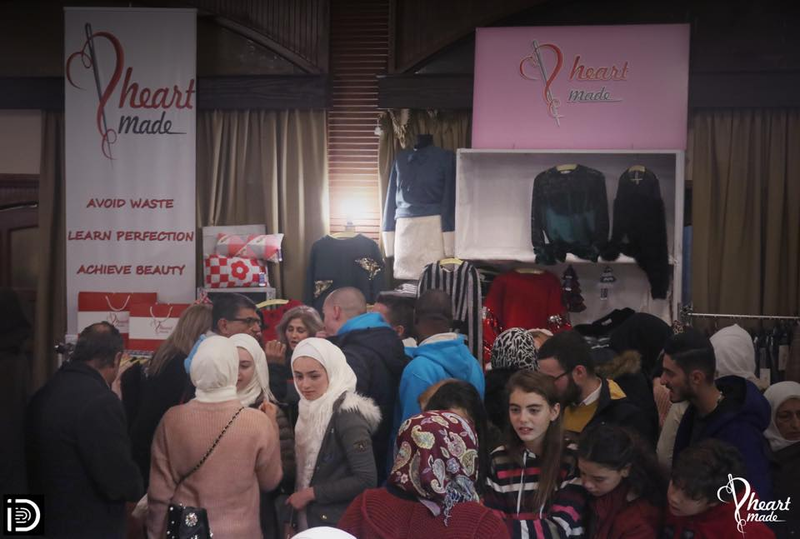 "In the difficult conditions facing the city, we wanted to offer a smile and show the love of the Syrians for life, creativity and art. 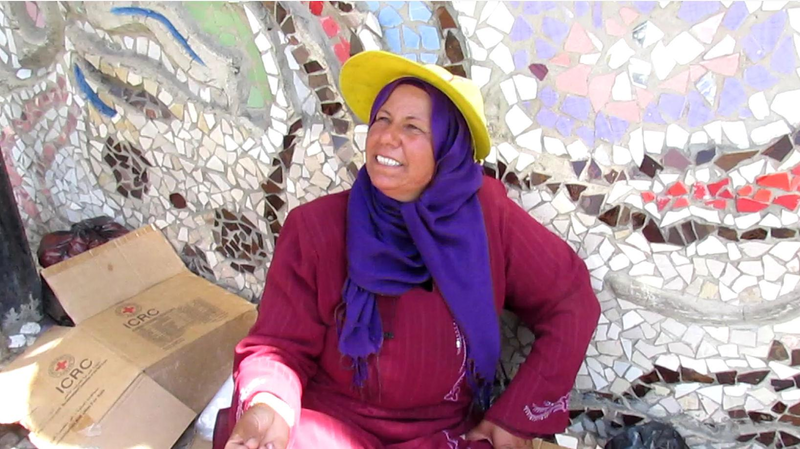 The work started in October 2013 and in January 2014 we had finished » explains the artist Moaffak Makhoul, coordinator of the Guiness mosaic. 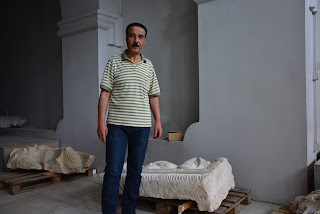 T-shirt and black trousers, he guides us in the library of Damascus museum for the education showing around. "These books were recovered from schools that were evacuated before the arrival of armed groups who occupied them, in Muhadamya, Ghouta, Daraya". Outside the silence of the library, the noisy and intense traffic causes one question: How do the Syrians keep their cars after seven years of war that have caused inflation and impoverishment? The young agronomist Dima Hassan – who is a bit our Virgilio, in Syria ... - does not have a car and lives modestly with her salary, which with the devaluation of the Syrian lira equals 30 euros, but she tries this answer: «Or have relatives abroad, or do three jobs, a situation now common here, or are depleting the savings they had before the war." Some people are exasperated in traffic jams and make jokes about the subway project: "A project which is twenty years old; is it so hard to dig? You could entrust the work to the terrorists of Jaysh al-Islam and to the other mercenaries who in a few years, in the eastern Ghouta area, were able to dug miles of tunnels to secure supplies in weapons and materials! " In front of the art school Abdel Hader, close to the library, the two artist sisters Rajab and Safa Wabi look at a high wall decorated in relief. 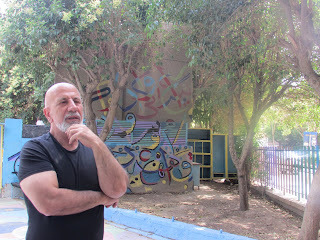 «We started, with several students, the street art in 2011, at the same time as the crisis that then resulted in the war. And we did not stop even when above our heads were raining mortars that came from areas outside Damascus in the hands of armed groups", says the sister, while the other continues, stretching his arm to a nearby building: "There a missile fell. Working on the street, we did not really have any shelter! But our work magnetically attracted many people, adults and children, and this helped us." They are approached by two little doves, in small and brown - may be they are the damascene version of our pigeons. 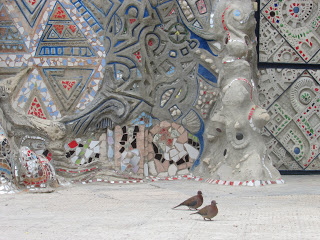 The artists indicate the sand and cement doves on the top of the wall: "We have put them as a symbol of peace". A peace that is not yet in Syria, where many fronts have closed but others are still opened. 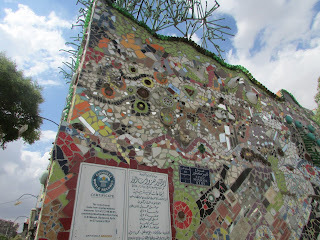 Certainly in the areas most affected by the conflict, instead of the mosaics there are rubble. For the post-war reconstruction, a titanic work, it is estimated a cost of 470 billion dollars. The machine has already started up with the rehabilitation of public utility buildings and private housings, preceded by the removal of the rubble. The foundation of the Aga Khan is already supporting the restoration of the historical architectural heritage, starting from the huge suq of Aleppo and other monuments of the Old City. Good news is that the huge amount of rubble will be partly recycled. "The Chinese companies are already at work, in addition to the Syrian government machine", assures a Syrian translator who previously studied and lived in Spain and decided to return to his country in 2014, at the height of the crisis. On the huge challenge of the reconstruction, the question is: who will pay to put the country back on its feet? Who will earn? 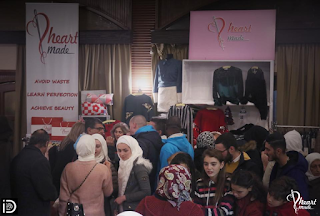 Joan, a student from Damascus whose father is from the Afrin area, hit by the bombing of the Turks, is drastic: "I really hope it does not become a business for the usual ones who first bring ruin and then earn on us... I say that Western countries, Turkey, the Gulf monarchs should compensate the Syrian people! They have fomented a war by proxy, they supported jihadist mercenaries ... ». The damages are much higher than the estimated economic figure show. Because the loss of human lives is priceless, and also the historical architectural and archaeological heritage cannot be refunded. The war has upset the methodical and often obscure work of archaeologists, restorers and officials. Occupied sites, warehouses of looted artefacts, damaged museums, threats to the life of the personnel. In one of the large laboratory rooms of the National Archaeological Museum of Damascus, cluttered with crates of artifacts, Rima Hawan, director of the restoration department, indicates pieces of statues from Palmira (Tadmor), a World Heritage Site that for ten months straddles 2015 and 2016 was besieged by the self-styled Islamic State (Isis, which in the Arab world is called Daesh, in a derogatory sense): "The situation was absolutely emergency". It was feared the total destruction of the site, in front of images proudly spread by Daesh, with the beheadings of statues and not only: the archaeologist Khaled al Asaad, after a life in Palmira to take care of the site, paid with his life - slaughtered the August 18, 2015 at age 83 - the refusal to reveal the places were the most precious stuff had been hidden to escape the fury. The director of the Palmira museum Khalil Hariri managed to escape at the last moment, but lost a brother and a cousin as well as several friends. 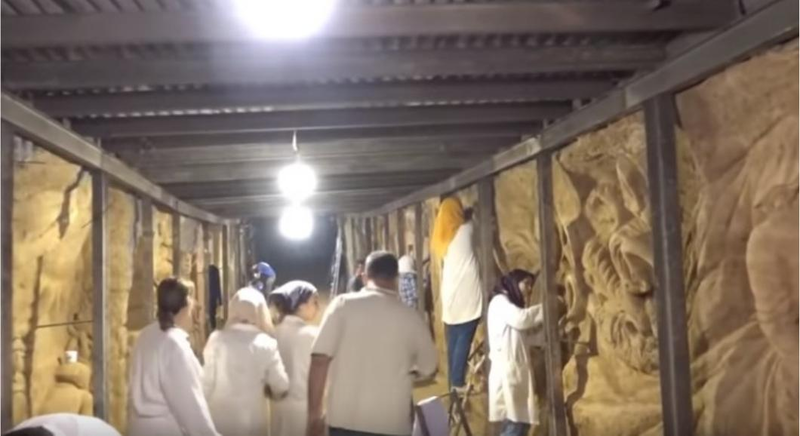 It is located in the museum of Damascus to follow the restoration projects of some statues taken away in time and in a fortunate way: "The terrorists took us by surprise with their advance. Everything seemed to be stronger than us, in those days. In addition to terror, we had a very strong memory of the looting of Iraq's historical heritage in 2003 during the Anglo-American invasion... But we managed with difficulty and danger to evacuate numerous artifacts, a sort of mission impossible» before the arrival of the devils. Among the areas of crisis there has been for years the National Museum of Aleppo, the one that seems guarded by the huge Hittite statues of dark basalt, the spirited eyes. In July 2016, when it was hit by several missiles and mortar shells fired by armed groups who controlled the Eastern part of the city, most of the collection was already safe. Hariri states that, in the emergence of those years, with the country divided into areas of influence among armed groups, "the Directorate for Antiquities had lost contact with two realities: Idlib, still controlled by Qaedist groups; and Raqqa». Raqqa: a toponym that for years has evoked terror since, in 2014, the city became the «capital of the caliphate» of the Islamic State. The city museum was rich in finds from various eras, up to prehistoric times. The Directorate had stored most of the collections in a series of buildings near the fortification of the Abbasid period at Heraqla, 7.5 kilometers to the museum. But already in March 2013, the Caliphate looted the warehouses and many pieces, mosaics, terracotta and plaster, the result of decades of excavation missions, left the country through the accomplice Turkey, destination the international market of finds. After all, pieces from Palmira were found for sale in London, one of the most important antiques markets... Anyhow the employees managed to evacuate or hide some of the transportable materials, and then recover three full crates found in Tabqa. ISIS had arrived to place explosive charges near the museum. This is a common destiny at about 300 sites of historical relevance. The war really is an angry elephant in a crystal shop. Let's go back to the archaeological museum in Damascus. 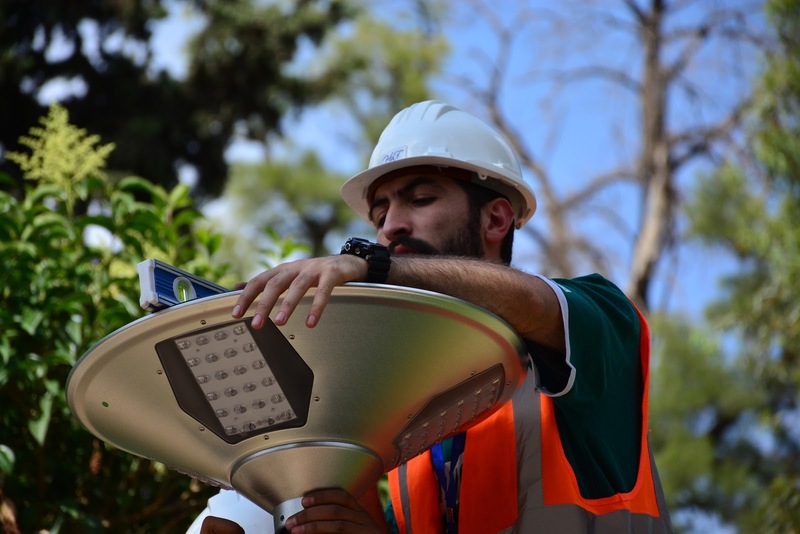 In the courtyard, among artifacts and trees, a small group of workers with orange jackets and helmets are installing a photovoltaic lamp. Interesting union between past and modern. A union which is normal as well as desirable for Mahmoud Alawadi, the manager of the company Htm Power solution: "Photovoltaics and archaeological heritage are both key elements of our future. The millennia of history will help us to rebuild. I think that the civilization of force that have staged certain states on our skin should oppose the force of civilization." Moreover, his deputy director of the company is Slava Abdo, who studied archeology and is full of futuristic enthusiasm: "Syria is the lady of the Sun. The sun is always there, solar energy is our future and must have the greatest attention". And solar thermal and photovoltaic can be seen around. Here and there, on the roofs of Aleppo and even in Kafarbatna in the eastern Ghouta on the buildings left standing, and in the urban and extra-urban streets to make traffic lights, street lamps, antennas work; up to the torches distributed in the centers for displaced persons. With the war, the supply of electricity and consequently the water supply itself became a problem. Renewable energies represent a solution, very convenient, says Slava, "If you calculate the costs for a diesel generator that compensates for the lack of electricity from thermal power stations, and compare them with those of panels that then work for 24 years ..."
The costs of planting of solar energy can discourage, but the reconstruction of Syria can be a good opportunity, Slava continues: "Photovoltaics are good for every place, in homes, streets, farms, industries ... Not only can they be equipped with reconstructed buildings, but they can be a great resource in the same work of reconstruction” And what about the production on the panels, which had started to be made in Syria before the war? "Currently, the cost-benefit ratio makes us prefer to import from China, but in two years we expect to have our own factory here," concludes Slava while she puts her foot on a platform that lights up. Alawadi proudly displays the operation of photovoltaic water pumps, which are very useful in agriculture. Agriculture: in the land of the fertile crescent, the primary sector has a history of many millennia behind it. The Italian geneticist Salvatore Ceccarelli, with the international organization Icarda - International Institute for Agricultural Research in Dry Areas - has worked extensively in the country with farmers, improving participatory traditional cereals (those cultivated for centuries and centuries), so as to obtain mixtures of varieties capable of responding to environmental and water crises. Mixtures now grown in various countries including Italy. And in Syria? Here, after the drought that has hit hard since 2008, seven years of war have seriously damaged food production, due to population displacements and clashes that have also involved rural areas and disrupted supply chains and transport. For this reason it was a small miracle, in a day of end of May, to see the beautiful color of apricots emerge from a box on a farmer's bike in Mleha, East Ghouta, a region near Damascus that was in the eye of the war tornado. The fruits cost 300 Syrian pounds per kilogram: before the war the apricots price was within everyone's reach, but now it is for a few, seen the lowering of wages. Exquisite fruit, a set of delicate flavors. The apricot tree, originally from China, seems to have found the elective homeland in Syria and Turkey. Kobol el arb (“before the war”), the inhabitants of the capital used to go on a trip to the Ghouta at the time of flowering. And they looked forward to the short season of apricot, an expression that is also a way of saying to indicate something fleeting. At the time of the Mamluks, to listen to the Egyptian traveler El Badri, the scholars would put themselves in... leave, leaving chairs and books to gorge the fruit. Which in Syria has inspired a true art of conservation and transformation. "After all, in Argentina we have the apricots called Damascus and now I understand why" says the actress Susana Oviedo, who is visiting Syria. What place will the primary sector have in the reconstruction of the country? And will the announced government plan for rural women really work? Here is a potential recipient: a food producer of Katana, in her yellow hat and bright blue scarf, arrives every day with a bus in the capital to sell her food. Her place is under one of the mosaics. Agri-culture is culture, after all.